Home Support Product FAQ Why do I always get “Analyze failed” error? Why do I always get “Analyze failed” error? 1. If the device is locked by the LockScreen password, please unlock it first. 2. Please make sure that you installed the latest version iTunes and reinstall it to have a try. Because any exception occurs in iTunes, it will impact the success rate of Analyze Devices. 3. If your iTunes backup files has been encrypted, please remove the password of iTunes backup file to have try. 1. Please check your USB connection is well connected or not. 2. Please restart your iPhone and computer. 3. Please change another computer to have a try if you have. 4. Please disconnect all other USB connections. 5. Please close anti-virus software if you have. If the case still occurs with several trying, you could contact our support team to solve the case. 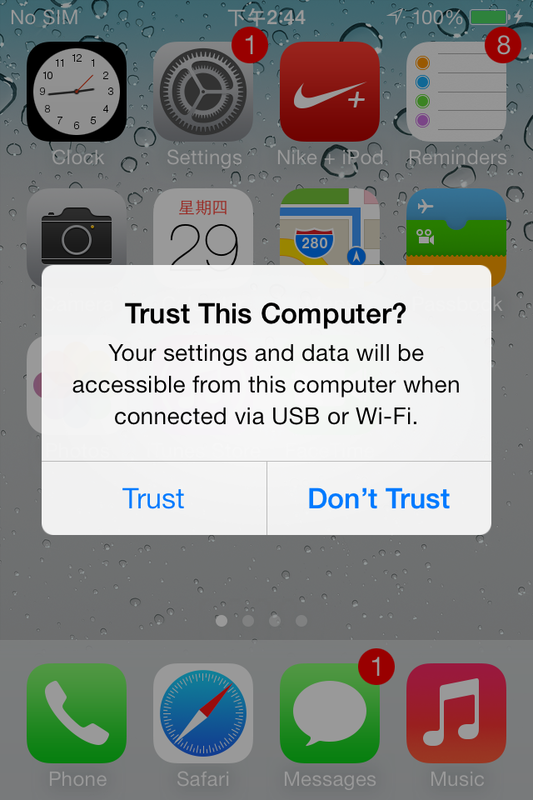 If it's your first time to connect your device with the computer, please click Trust when the page below appeared on your device. Prev: How to exit Device Scanning Mode (Restart device to normal)? Next: Why these recovered emoticons cannot be previewed with other browser?